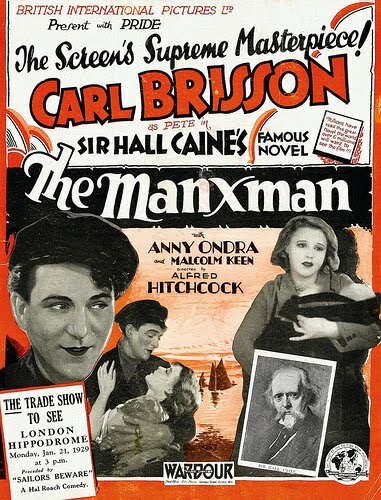 Though a relatively suspense-free melodrama, The Manxman (1929) contains several of Hitch's recurring themes. Was Norman Bates really a murderer and transvestite? The answer might seem obvious, until you read an essay on Psycho that was shared in one of my Hitchcock discussion groups. Dr. Fred Richmond: I got the whole story — but not from Norman. I got it from his mother. Norman Bates no longer exists. He only half-existed to begin with. And now, the other half has taken over. Probably for all time. Lila Crane: Did he kill my sister? Dr. Fred Richmond: Yes — and no. That yes-and-no ambivalence is a defining characteristic of Hitch's movies, going all the way back to his silent period. Take The Manxman (1929), for example. Pete (in the turtlneck), with Philip and Kate. Note that in one of the few scenes in which the three are framed together, Philip has literally come between Pete and Kate. A truly messed-up love triangle, its plot revolves around three inhabitants on the Isle of Man: Pete, a fisherman; Philip, a lawyer; and Kate, the girl they both love. When Pete leaves the island to make his fortune and win Kate's hand in marriage, she and Philip fall in love and have relations of Biblical proportions, whereupon Kate gets pregnant. Then Pete unexpectedly returns home. She marries him as promised, only to find herself compromised from every angle. 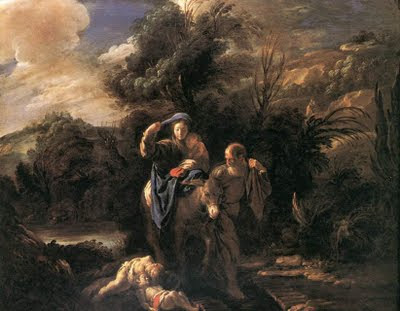 Finally, she and Philip are forced to leave in humiliation. On his blog, Ken Mogg made reference to the "elaborate lighthouse symbolism" of The Manxman. Normally, lighthouses — and their keepers — symbolize vigilance, dependability, watchfulness. 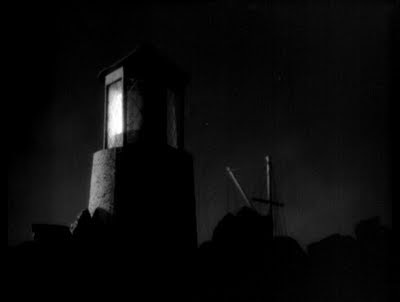 An early low-angle shot of the town lighthouse seems to point to this — particularly in view of the movie's religious overtones. (See the book of Isaiah: "Watchman, what of the night?") But, to my eye, the lighthouse in The Manxman isn't as straightforward as that. The emphasis seems here to be on the tower's swiveling beam, which illuminates land and sea, but then plunges them into darkness, revolving between light and dark, illumination and obscurity. This oscillation doesn't conjure up an image of a steadfast, unblinking Observer. Early on, Kate (played by the delectable Anny Ondra as the first Hitchcock Blonde) is ambivalent in her feelings about Pete (Carl Brisson). When he comes to her window to ask her to wait for him as he goes abroad to seek his fortune, coquettishly, teasingly, she says yes and then counters it with a "no." Though she acts as if she's playing a game, it's evident that she doesn't have a clear answer for him in her heart. Or, more precisely, she is ambivalent and has two clear answers: yes and no. In truth, her only honest answer could be an unsatisfactory "maybe I'll wait — and maybe I won't." But who has the courage to be that brutally honest? Nevertheless, she gives him her word that she will wait — only to regret it immediately afterward. When he leaves, she shuts the window and the troubled look on her face reveals that she is conflicted about her decision. 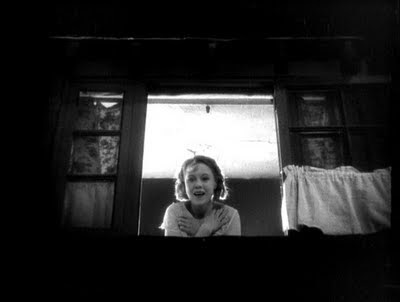 In this scene, the beam from the lighthouse shines on and off through her window, echoing her own conflicted state of mind. 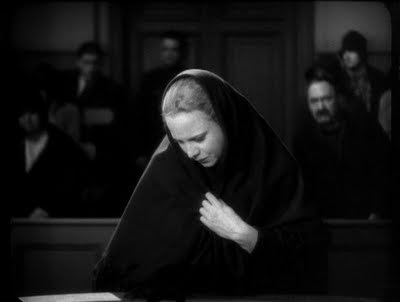 This movie, stuffed as it is with religious references and symbols, seems to point to an all-seeing Judge who will set matters straight in His own time. Superficially, audiences could see it as a fable or a sermon based on the motto-like scripture that opens the film, "What does it benefit a man if he gains the whole world but loses his soul?" (Mark 8:36) No sooner is that moralism spelled out, however, than it is undermined. The eternal Judge (i.e. 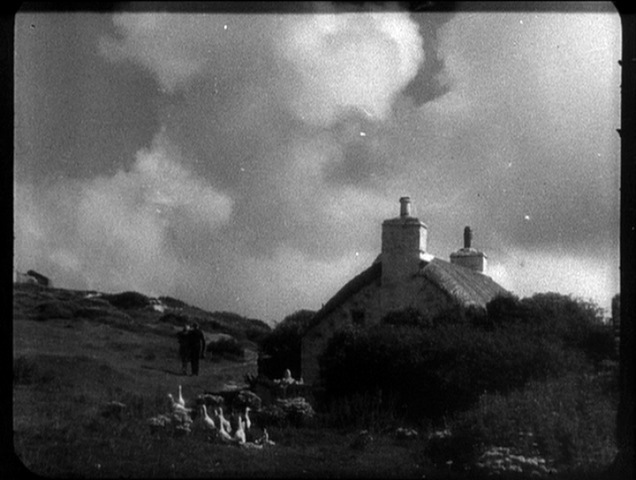 God) of The Manxman isn't all that cut and dried, and whatever religiosity the film might promote is tendered ironically. 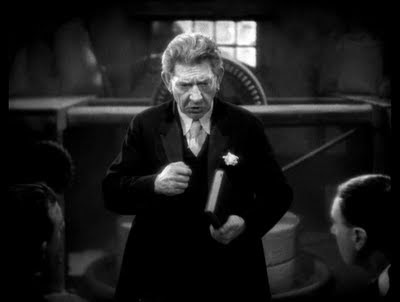 For instance, Caesar (Randle Ayrton), who delivers the wedding breakfast "sermon" (which Pete calls all-too-accurately a funeral sermon — for an ill-fated marriage) about the wheels of God grinding slowly, is a comic figure. We're encouraged to laugh at the coot and his old-fangled Bible-thumping. If the oscillating town lighthouse has religious overtones in this movie then it might suggest that mankind's all-seeing Judge/Watchman is prone now and then to take his eye off the ball. He might render final justice — then, again, he might not. 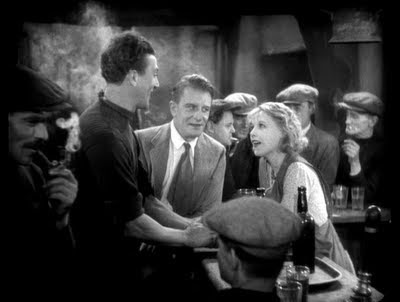 The film's ending, with its sad shot of Kate and Phil (Malcolm Keen) slouching away from town seems to me to leave it open as to whether Divine Justice will in fact set things straight. This shot seems to be an ironic reference to classical and romantic paintings of Mary, Joseph and Jesus' flight to Egypt. 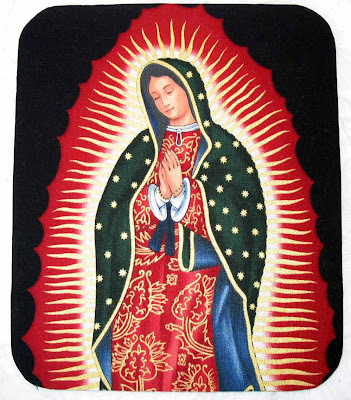 The Virgin of Guadeloupe mousepad. 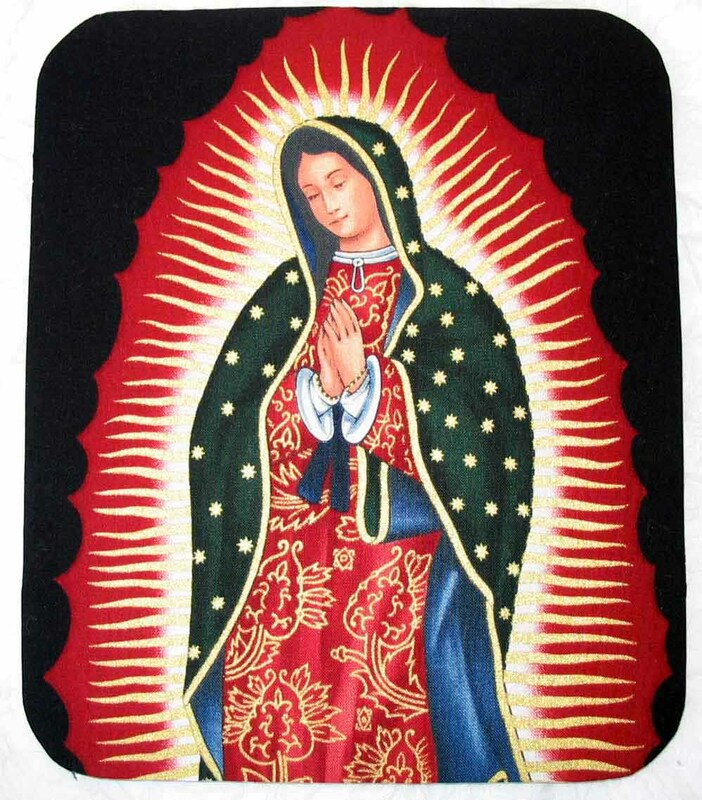 Earlier, at her wedding and as her sins came to light in the courthouse, Kate resembled the Virgin Mary — the ironic joke being that she was no virgin. That yes-and-no ambivalence recurs throughout Hitch's films. Similarly, a yes-and-no answer could be given to the question of whether Hitch made ghost stories, whether his films are sexist (and, conversely, whether his films are feminist), or just about any other "theory" that one might try to attach to his films. And this ambivalence comes through in a coy, playful, teasing manner that is also dead serious. Not unlike Kate at her bedroom window. For more Manxman fun, tune in tomorrow.